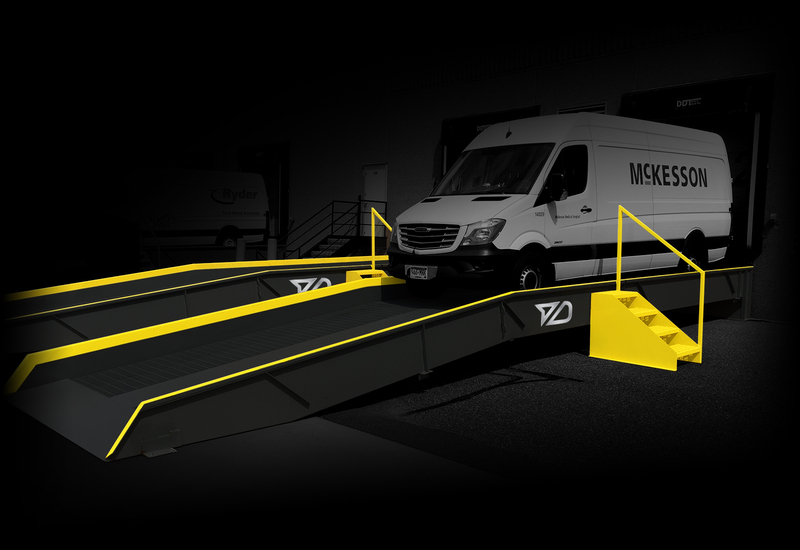 Our parcel dock ramps eliminate ergonomic issues involved in manually loading when a delivery vehicle arrives below dock height. When parcel delivery trucks attempt to use the same loading dock as higher semi trailers, employees often make up for the height discrepancy by hoisting boxes up to the building floor, and moving the boxes again at dock level. These shipping dock ramps raise the truck or van so that employees can handle fewer times, and expedite packages more efficiently, without risk of injury. Featuring open-serrated bar grating for increased traction and to allow snow and rain to fall through, these removable, relocatable ramps are tailored to each building’s specific needs. They can be equipped with stair assemblies and built in special widths depending on the application. Eliminate employee redundancies and keep delivery trucks on the road.